The TSI Mass Flowmeter 4140 (0.01-20L/min Air, O2, N2 1/4" tube) can be used for a multitude of gas flow measurement applications. Whether measuring gas flows in a laboratory or manufacturing setting, TSI general purpose mass flowmeters provide accurate results with multiple data output options. 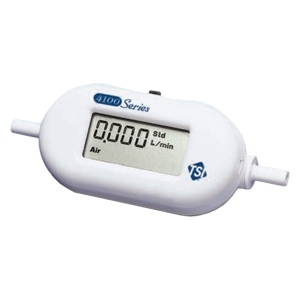 The display versions come complete with accessories making setup and operation fast and convenient. The TSI mass flowmeters are specified as two percent of flow rate reading. One TSI mass flow meter covers the same range as three percent (or more) of full scale devices, with better accuracy at most points. Four millisecond response ensures accuracy in fluctuating flows. This fast response time of the TSI mass flowmeter is ideal for closed-loop control systems and integrated volume measurements. Low pressure drop of the TSI mass flowmeter minimizes flow circuit back pressure and its impact on the system.